When you think of prog rock flautists, surely Ian Anderson and his legendary band Jethro Tull are the first two names that come to mind. 2012 marks the 40th anniversary of Tull’s chart topping concept album, Thick As A Brick. In 1972, Ian Anderson wrote and recorded the Jethro Tull Progressive Rock classic album ‘Thick As A Brick’. The lyrics were credited at the time to the fictitious child character, Gerald Bostock, whose parents supposedly lied about his age. The record instantly became a number one Billboard Chart album and enjoyed considerable success in many countries of the world. The TAAB 40th Anniversary Edition features a new 5.1 stereo mix, mixed by Steven Wilson, plus a DVD containing DTS & Dolby Digital 5.1 surround mix, high quality stereos 96/24 (new mix and 1972 flat transfer), the original newspaper over 40 pages, an article by Classic Rock’s Dom Lawson, rare photos from photographers Didi Zill and Robert Ellis, recording and touring mementos and much more, all contained in 104 page 7 ½”x 5 ½” hardback book. It will also be available as a 2 LP set with the original Thick As A Brick remix, and the new Thick As A Brick 2, both as 180gm audiophile pressings and available for the first time in vinyl. The package also has a 72-page 12×12 book all held in a hard card slipcase. In honor of the epic re-release of Jethro Tull’s classic concept album, I’m giving away two awesome prize packs: 1) Jethro Tull’s full catalog on CD (including the TAAB 40th Anniversary edition), and 2) A signed copy of Thick As A Brick Part 2 (the 2012 follow-up to TAAB) and a TAAB 40th Anniversary vinyl 2LP. Enter the TAAB 40th anniversary sweepstakes at www.bumpershine.com/jethrotull. Contest ends on December 1 at midnight, 1 entry per household, US and Canadian entrants only. Ian Anderson tour dates and Thick As A Brick 40th anniversary edition details after the jump. – The original newspaper rebuilt for the 12 x 12 format on 16 pages of newspaper style paper (but more durable). – The 2012 newspaper printed on gloss paper (originally pdf files on the TAAB 2 DVD). 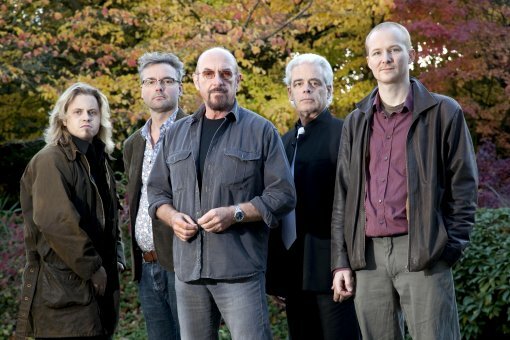 – An Ian Anderson interview conducted by The Reverend George Pitcher covering both albums, and the current 2012 tour. – Many rare 1972/73 photos from photographers Didi Zill and Robert Ellis covering ‘street’ and live situations and 2012 tour photos by Martin Webb. – Memories of the recording from engineer Robin Black. – Recording and touring memories from Martin Barre, Ian Anderson and Jeffrey Hammond. – Q & A with tour manager Eric Brooks with tour memorabilia and the full 1972 itinerary. A 2 x LP set with the original Thick As A Brick remixed, and the new Thick As A Brick 2, both as 180gm audiophile pressings and available for the first time in vinyl. The package also has a 72 page 12×12 book all held in a hard card slipcase.